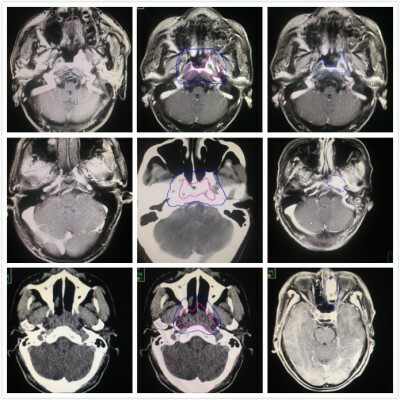 Background: To demonstrate the robustness of clinical target volume delineation for nasopharyngeal carcinoma (NPC) patients, this study makes a detailed analysis of the initial irradiated dose of the recurrent site and local failure patterns after intensity-modulated radiation therapy (IMRT). Based on this analysis, further improvement of delineation recommendations may be made in order to improve the quality-of-life in NPC, without decreasing the local control and survival rate. Methods: In total, 382 newly diagnosed non-metastatic NPC patients were retrospectively enrolled, receiving elective neck irradiation to levels II, III, and VA. For patients with local failure, the location and extent of local failures were transferred to the pretreatment planning computed tomography (CT) for dosimetric analysis. The dose of radiation received by GTVr (gross tumor volume of recurrence) was calculated and analyzed with dose-volume histogram (DVH). Failures were classified as: “in field” if 95% of GTVr was within the 95% isodose, “marginal” if 20%–95% of GTVr was within the 95% isodose, or “outside” if less than 20% of GTVr was inside the 95% isodose. Results: With a median follow-up time of 61.3 months, 12 patients developed local recurrence (10 cases available). The 5-year overall survival, local relapse–free survival, regional relapse–free survival, distant metastasis failure–free survival, and disease–free survival were 87.8%, 95.2%, 99.1%, 93.3%, and 82.5%, respectively. Dose conformity with IMRT was excellent, and the recurrence was mainly within 3 years after the first treatment. The dosimetric analysis showed that seven failures were classified as “in-field”, two failures as “marginal”, and only one failure as “out-field”. Most local relapse sites located just the same site of primary tumor and most anatomic sites were at low risk of concurrent bilateral tumor invasion. Conclusions: IMRT with elective neck irradiation provides excellent local control for NPC patients without cervical lymph node metastasis. In-field failures are the main patterns for local recurrence, and the radioresistant subvolumes within the gross tumor volume are needed to be identified. This study proposed suggestions for reduction of target volume during IMRT treatment for NPC patients.